Auditing your storage operation can help you identify weak spots and increase revenue. Beyond identifying theft, owners can use audits to train staff, improve processes and ensure all laws are being followed. 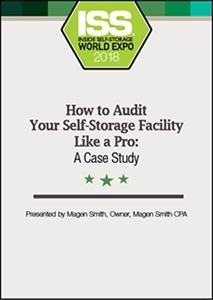 Learning how to effectively audit your self-storage operation can help you identify weak spots and increase revenue. Beyond identifying theft, owners can use audits to train staff, improve processes and ensure all local laws are being followed. Our presenter will share real examples of audit results and how owners not only found deficiencies in their operations but improved their business. DVD - Self-Storage Facility Auditing: Does Your System Meet Up-to-Date Standards?